We are pleased to confirm the speakers and theme for the 2017 David Hunter Memorial Lecture. 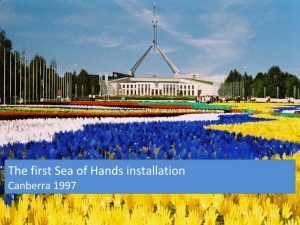 Sea of Hands photo from: https://www.slideshare.net/ANTaR/sea-of-hands. Can you help ANTaR ACT? We’ve had a great year, but so much more that we want to achieve – can you help us? Help in putting together the monthly bulletin on local events and ANTaR ACT activities. Please email info@antaract.org.au if you would can help or would like to find out more. It is not necessary to be able to come to the monthly meetings, although always welcome. The next ANTaR ACT monthly meeting will be held on Monday 2 October (yes, a public holiday), 6pm, at King O’Malleys, in the Snug Room behind the bar. Come along and help us in planning the David Hunter Memorial Lecture and mark the 20th anniversary of the Sea of Hands.